Destination Goat Island is part of Eskasoni First Nation and has a partnership with Eskasoni Cultural Journeys. The island includes a groomed walking trail, picnic areas and various cultural sites. Enjoy a leisurely stroll along the beautiful trails of Goat Island and be sure to watch for bald eagles that nest nearby and make this area their home. Along the Goat Island Trail you will see the unspoiled natural beauty of the Bras d’Or Lakes, Canada’s Inland Sea. Meet interpretive guides who will share Mi’kmaq history and culture through stories music and various demonstrations. Interpreters will demonstrate their knowledge of medicinal plants, herbs, how to construct a wigwam and the history of Eskasoni and Goat Island. 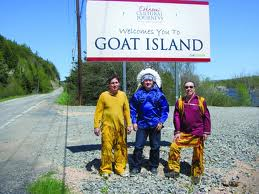 Goat Island is located within the First Nations community of Eskasoni and was originally called Indian Island. Goat Island is so named because, during centralization, goats were placed in the community for farming purposes. After they began to eat everything in the community, the goats were taken and placed on the Island. Come and visit Goat Island! Experience the tranquility and learn about our Mi’kmaq culture and heritage. Immerse yourself in our past and learn from our personal stories and history. Come and make new friends and create your own story. -Tour times are approximate. Eskasoni Cultural Journeys reserves the right to cancel or modify any trip due to weather conditions or any unforeseen circumstances. Rates and departures subject to change without notice. -Our vessels are completely outfitted and approved by Transport Canada. Our captains are certified and have experience in the Bras d’Or Lakes. -We are able to accommodate quests with special dietary needs upon request. Our cooks can develop a custom menu based on availability and pricing. – It is recommended that you wear comfortable walking shoes and take a sweater or coat as the weather can change during the day. -Tour prices are in Canadian funds and include 15% Harmonized Sale Tax. There are customized workshops available upon request. For example, you can learn to make a basket, cook and or drum and dance as well as a basic Mi’kmaq language class for beginners. Children can learn to make a bookmark from one of the master artisans in the community. We require a 15% deposit (Visa or Master Card) at the time of booking your reservation. Tours must be cancelled within one week prior to the tour departure date or the deposit will be non-refundable. This journey will take school aged children back in time and provide insight into the Mi’Kmaq culture that is our living history. The children will begin their tour with a welcome and a guided hike around the Goat Island Trails in Eskasoni on the shores of the Bras d’Or Lakes. Our guides will speak of the Mi’kmaq ways for food and clothing and the use of the water and eco-system around the Bras d’Or Lakes. They will then learn a Mi’Kmaq dance and have a traditional snack before saying their good-byes and heading out. This is an excellent interactive and fun learning experience for children of all ages. Join our Mi’Kmaq tour guides as they welcome you to Goat Island In Eskasoni First nation. You will be a part of a smudging ceremony before boarding a fishing vessel at the fisheries wharf for a guided tour of the Bras d’Or Lakes. Once you arrive back on shore, savour an authentic traditional feast with a cultural performance and a lesson in dance. Listen to the sounds of the music and language and learn about ancient traditions and ceremonies. Following your meal and performance, you will be led on a guided tour of Goat Island with a final good-bye and gift. Price- $85.00 per person (HST included – includes traditional feast). Prepare yourself for the unique and moving experience of Goat Island, Eskasoni First Nation. Enjoy a welcome and smudging ceremony before boarding a fishing vessel for a guided tour of the Bras d’Or Lakes. 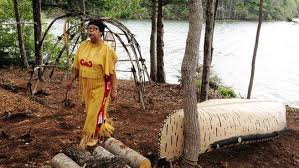 A small traditional snack will be served and then you will hike along the Goat Island Trail with our Mi’Kmaq interpreters with a lesson in dance while you are there.